There was never a chance that Alexander's empire would remain intact. He may or may not have left his empire "to the strongest" - but his generals certainly took it that way. The Greek term for Alexander's numerous wannabe successors was "the diadochoi" - men in a relay race who pass a lighted torch from one to the other: well, some dropped it, and many got burned! 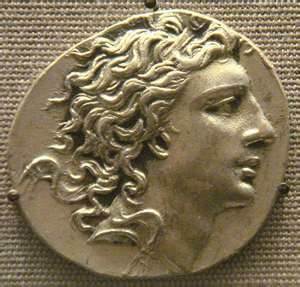 The chaos and turmoil that followed Alexander's death does show one thing for certain : the Achaemenids did it much better. For 250 years, the Achaemenids had ruled over a stable and largely peaceful empire - they'd lost Egypt temporarily, they'd had noisy neighbours on their western flank for a while, there had been violent scenes often between the death of one King of Kings and the succession of the next. But the empire had always held together - thanks to the skilled and sophisticated civil service which we glimpse in the Persepolis tablets (PFA and PTA), good communications, and a single currency. And not forgetting a general tolerance and acceptance of diversity in language, religion, culture and ethnicity. Only trouble-makers had anything to fear. Always the most different and "detachable" of the Persian satrapies, because of its unique culture and economy. Egypt was grabbed almost at once by the most cunning of Alexander's Macedonian chums, Ptolemy. He soon added Cyprus, Cyrenaica, Phoenicia and Cilicia (all places from where he feared an attack on Egypt could be launched) - as well as making sure he had a real trump card - Alexander's embalmed corpse. This was taken to Alexandria, and displayed as a symbol of Ptolemy's right to rule. Ptolemy's descendants ruled in Egypt - taking a cue from Alexander in adopting local traditions - until 31 BC, when the last of his family, Cleopatra VII, was deposed by the Romans. 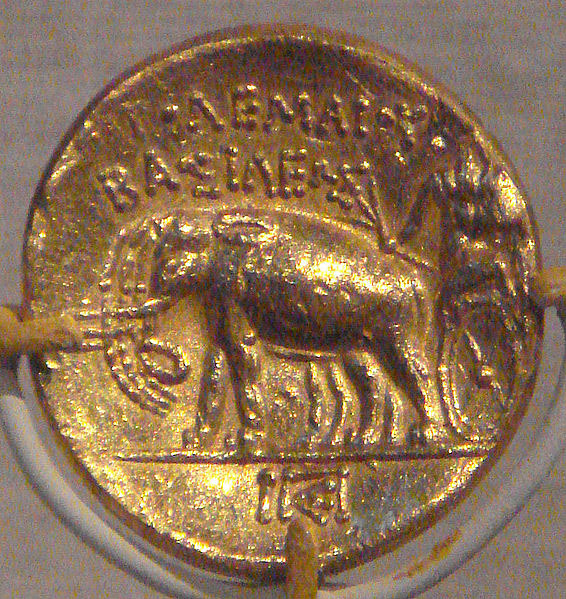 Regarded by the Macedonians (except clever Ptolemy) as the first prize, the homeland was immediately separated from the rest of the empire, and fought over bitterly. Some of the Greeks themselves, while this was going on, managed to organise themselves (eventually) into two viable leagues, but they were always under threat from their fierce northern neighbours. When threatened, they did what Greeks had always done - appealed for help to the current super-power: Rome, of course, no longer Persia. At first the Romans tried to "free" Greece - but a free Greece soon reverted to its traditions of inter-community warfare. The Romans lost their patience, and took them over - and the Macedonians as well. In 146 BC Achaea and Macedonia became two provinces of the Roman empire. 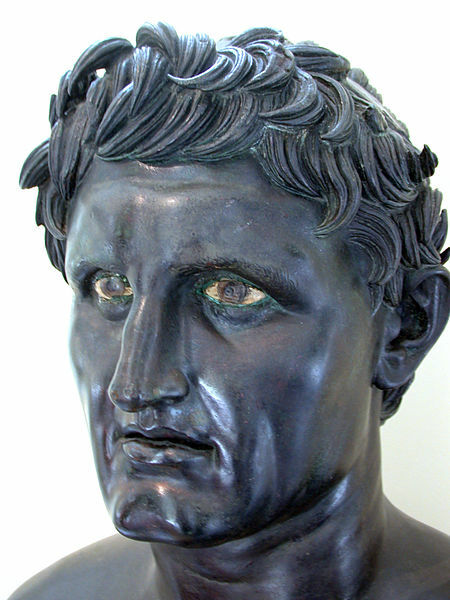 Mithridates VI of Pontus: trying to look like Alexander. A kingdom along the southern coast of the Black Sea, which had been largely left to its own devices by the Persians. It became fully independent in 302 BC, under Mithridates I. Pontus was happy to live at peace with its neighbours until, in 120 BC, at about the time the Romans were consolidating their new lands in the area, Mithridates VI became king. His propaganda made him a descendant of both Cyrus and Alexander. His ambitions certainly matched theirs. Posing as the champion of Greek freedom, and the liberator from the Romans, he was at first brilliantly successful. Athens welcomed him. But when he ordered a massacre of all Romans in Asia - 80,000 or more may have died - the Romans needed to crush him. They did not find it easy. It took three wars (between 88 and 63 BC) before he was finally beaten by Pompey. 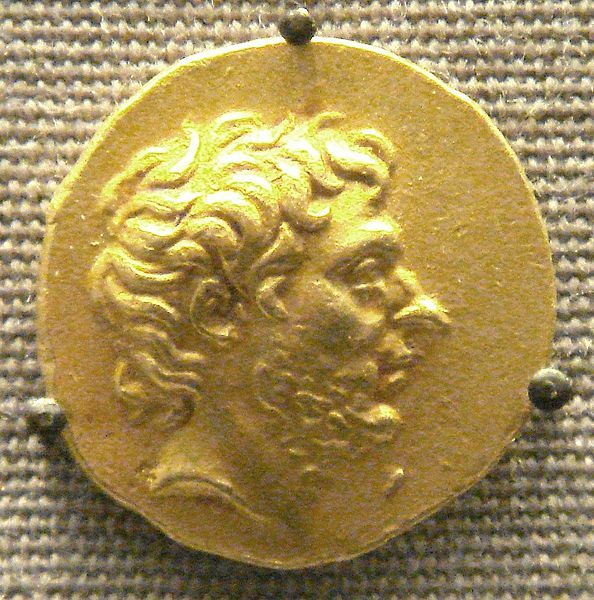 Unobtrusively became an independent kingdom under king Artaxias I (190 - 160 BC) and his successors. 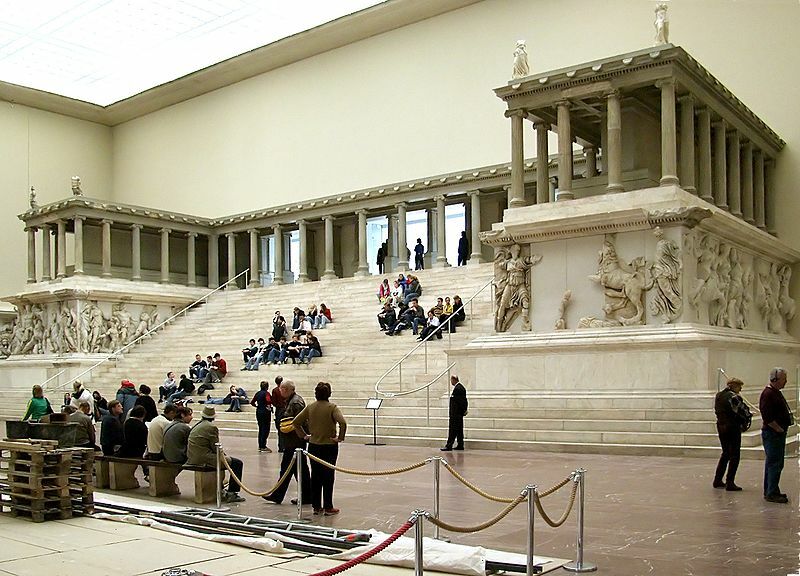 The Pergamum altar now in Berlin (photo AMW). The kingdom of Pergamum eventually took over most of Anatolia. From 281 BC, under its Greek kings, the Attalids, it became the wealthiest and most powerful state in the region, rewarded for the help given to the Romans against the Seleucids. The capital became one of the most beautiful and well-designed cities in the ancient world. But the man who was to be the last king, Attalus III, had no heir, and was afraid his kingdom would fall apart after he died. To avoid this, he left it in his will to the people of Rome in 133 BC. The kingdom of Pergamum became the Roman province of Asia. This territory was fought over in five separate wars between the Ptolemies and the Seleucids. One of their battles, the Battle of Raphia (now Rafah near Gaza) in 217 BC was supposedly the biggest ever fought in the ancient world. In 165 BC, the Judaeans, sick of religious oppression by the Seleucids, rebelled (under the Hasmoneans or Maccabees), and in 140 BC created their own independent state. This was possible, because the Seleucids were by now in trouble on their eastern front from the Parthians. The Parthians also worried the Romans, who took over Syria after the defeat of Mithridates VI of Pontus. Judaea became a "client-kingdom" of Rome under Herod the Great (40 - 4 BC), and a full province in AD 6. Soon after Alexander's death, Atropates, a Persian who'd been satrap of Media under the Achaemenids and kept on by Alexander, grabbed the northern part of the satrapy and proclaimed it an independent kingdom. The kingdom became known as Media Atropatene after its founder - and is the ultimate origin of the name Azerbaijan. It was absorbed by the Parthians in the 1st century BC. The Seleucid heartland, which Seleucus I had to defend vigorously against rival Macedonian claimants at first. He built a new capital on the Tigris, named Seleuceia after himself, which soon eclipsed Babylon. In due course, though, it too fell to the Parthians. One of the few administrative successes of Alexander was the appointment of the able Macedonian Peucestas as satrap of Persis - the only Macedonian who bothered to learn Persian. He continued as satrap after Alexander's death until the inevitable elimination by a fellow Macedonian. 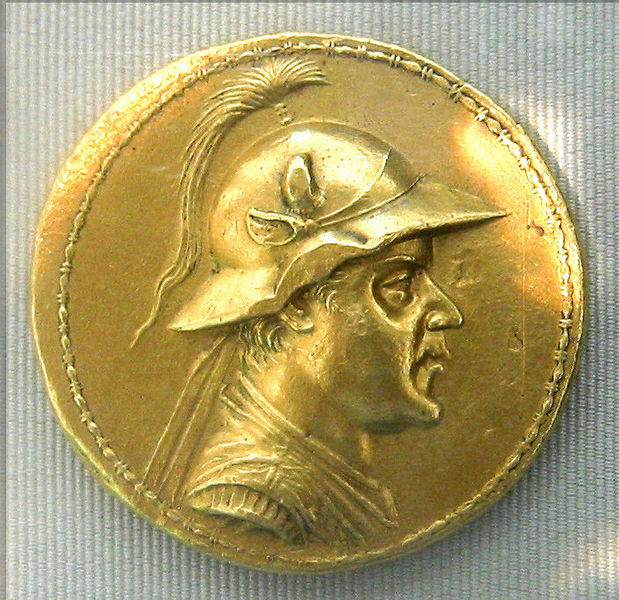 Persis, though, continued to be virtually self-governing, issuing its own coins, even after its take-over by Seleucus. Few would have guessed that from this satrapy to the south-east of the Caspian Sea would come the successors not just of the Seleucids, but of the Achaemenids themselves - a new Persian empire. Their breakaway began in 247 BC with a rebel Greek satrap, inspired by the successful secession of Bactria to the east, called Andragoras … full story on the next page. Weirdly, it was in these far eastern satrapies in Central Asia that Greek influence remained much stronger than in more westerly provinces - perhaps because the Achaemenids had transported various annoying Greek communities there from elsewhere in the empire, and because a large Macedonian garrison was needed against the marauding Saka. 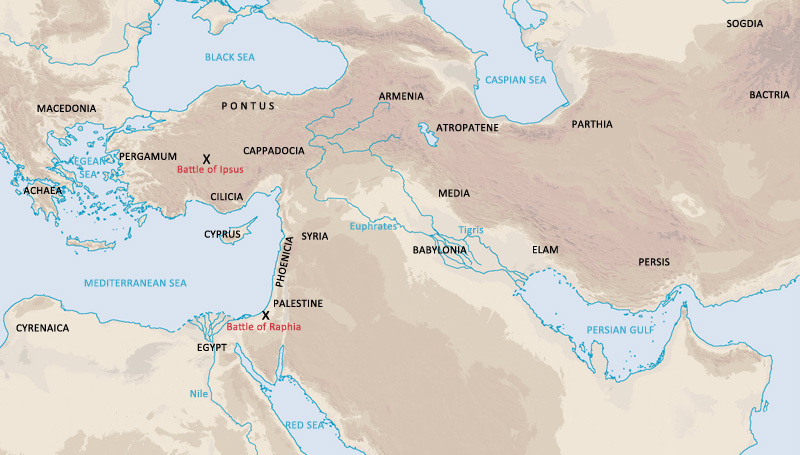 The Seleucid satrap of Bactria proclaimed independence in around 255 BC. It remained an independent kingdom until 125 BC, when it was overrun by the Yuezhi people from Turkestan. Greek was the official language, and Greek culture flourished in this unlikely outpost (see Ai Khanum on the next page). The Greco-Bactrians even invaded India, establishing a Greek-speaking Buddhist dynasty that hung on until maybe AD 20. The prosperity of Bactria had two consequences: it attracted the unwelcome attention of the Saka and the Yuezhi, nomadic nations to the north and east, who eventually destroyed the kingdom. It also brought Bactria to the attention of China (127 BC) - leading to the establishment of the so-called Silk Route which soon enabled trade between China and the Roman empire, and brought wealth not to the soon-to-be defunct Bactrians, but to their eventual successors, the Parthians. After a battle in 305 BC with Chandragupta , founder of the Maurya empire in India, who had united most of what's now northern India, Pakistan and Bangla Desh, Seleucus was forced to give up, not only India, but several of his eastern satrapies. In return he was given 500 elephants: not such a bad deal, as they helped him win the vital Battle of Ipsus in 301 BC, which consolidated his position, but underlined the failure of the Diadochoi to reconstitute Alexander's empire. WHAT DID THE SELEUCIDS DO FOR US? Alexander's successors, the Diadochoi, fought incessantly among themselves, giving opportunities for others to exploit the chaos. Principal beneficiaries were the Romans and the Parthians. Diodorus is main source for the Diadochoi (to 272 BC)- he uses lost Hieronymus of Cardia, who also provides some useful data for Plutarch and Arrian. Polybius covers 264 - 146 BC. Other writers include Appian, Roman History, and Justin's epitome of Pompeius Trogus. He'd married her 5 years ago - supposedly it was a love match. To some extent - the Ptolemies always spoke Greek; Cleopatra was the first of the family to learn Egyptian. They had however adopted the Egyptian custom of brother-sister marriage: to ensure that all wealth stayed in the family. This was the Persian name for a group of peoples usually called Scythians by the Greeks. It's not a very precise ethnic term - but could cover any of the nations living to the north of the Persian empire. They were Iranians, related to the Medes and Persians, who would have had a similar culture themselves before moving down on to the Iranian plateau. They were nomadic, and horses played a vital part in their way of life. The Massagetae, who had killed Cyrus the Great, were a branch of the Saka. We learn from Chinese sources that they were a nation forced to leave their home in Chinese Turkestan after being slaughtered by the Han emperor of China. They defeated the Saka and eventually established an empire of their own in Bactria and India (becoming known as the Kushans). Like the Saka and other peoples of the steppes, their military strength came from their horse-archers: later to be the main WMD of the Parthians.